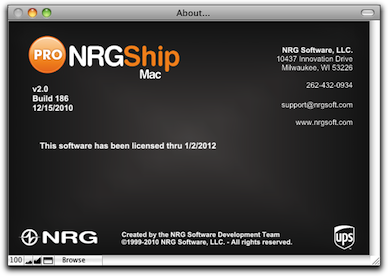 NRG: Mac & FileMaker Shipping Software :: How do I find out what the version and build number is for my NRGship UPS solution? How do I find out what the version and build number is for my NRGship UPS solution? On the file menu, select NRGship > About NRGship. This window below will be displayed with the current version and build number (in parentheses). 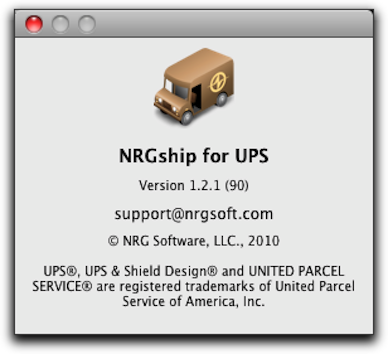 On the file menu, select NRGship UPS Pro > About NRGship. This window below will be displayed with the current version and build number. 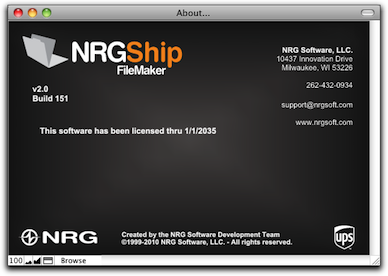 On the file menu, select FileMaker Pro > About NRGship. This window below will be displayed with the current version and build number.